Welcome to Found Off The Street, our look at cars found on the cape that rust liked so much it decided to summer there; Cape Cod, MA. Today we have a 1977 Volkswagen Beetle. 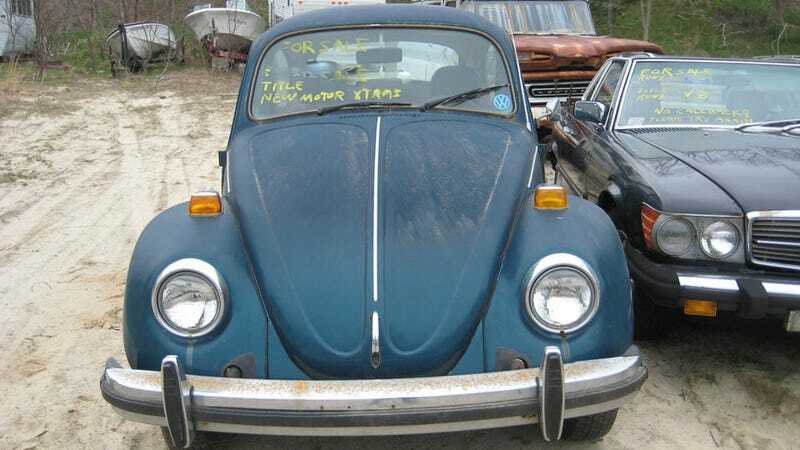 Last week's 1962 Buick Invicta and this week's 1977 Volkswagen Beetle are both waiting to find a new owner but are looking for two very different people. Last week's Buick needed only a driver to be ready for top down summer cruising. While we aren't exactly sure what this Bug needs to go cruising, it is certainly more than just a driver. Something about old Volkswagens inspire otherwise rational people to keep an old car sitting around rather than getting rid of it. It's a bizarre phenomenon that has played out many times, all over the country. While it could be attributed to the sheer volume of Bugs made, I tend to believe it is something more. Size, simplicity and sentimentality form a perfect combination that leads to many people tucking away their old Volkswagens when most other cars would be junked. sitting VWs are a fairly common sight. While growing up on the cape that rust remembered, seeing an old Volkswagen sitting in someone's yard or next to a building was reasonably common. Unfortunately, a decade or two later the hostile environment of the cape has made the hoarded Volkswagen, even of this vintage, a fairly uncommon sight. To be honest, the exact vintage of this Bug is unknown, 1977 is just a somewhat educated guess. While I do not claim to be a Volkswagen expert, I do know 1975 was the first year Fuel Injection was offered on a Bug. From there, this Beetle has separate headrests and doesn't appear to be a Super Beetle, which leads me to somewhat confidently guess this particular model is a 1977. By the late 1970s, the air cooled Volkswagen Beetle was at the end of its long and successful production run in America. More modern automotive designs had found favor with buyers and Beetles suffered accordingly. In response, Volkswagen decided to slowly phase the model out. Beetle sedans were only sold in the US until August of 1977, while convertibles lasted until January of 1980 in the US market. Most of the convertibles sold in this time period were well optioned, fairly expensive examples, a far cry from the original affordable people's car introduced to America several decades earlier. While many Volkswagens of the late 70s were purchased as collectible investments or sunny day cruisers, it appears this particular example was used for the purpose the Beetle was originally built for, cheap and reliable transportation. As you might expect, this Bug has the rusty scars underneath to prove its useful life in the Northeast. Currently parked in front of the FOTS '61 Suburban and next to a Mercedes 380sl convertible, this VW is waiting for a new owner with an appropriate amount of time and ambition to return it to roadworthy condition. Even though they aren't the most desirable or exciting vehicles, I always find weird old project cars like this Volkswagen very interesting. This car needs more work and rust repair than could be justified by its potential value, so anyone undertaking the task of bringing it back to life will be doing so solely for personal project car hell value. Sometimes these type of project cars sit for years in the same place waiting for the right buyer and sometimes they are gone almost as quickly as they appear. Regardless of my own level of personal interest, I always stop and take a look at these cars when I come across them. I often find myself wondering if and when the right person will find the car and bring it back to life. While I know this Volkswagen has only been where you see it currently for a few weeks, I can only watch and wait to find out how long this potential project car hell Volkswagen will stay there.